The box score of the Heat's 93-79 win over the Celtics in Game 1 of the Eastern Conference Finals contains plenty of evidence of Miami's dominance. Both the 48-33 rebounding edge as well as the 11-1 advantage in blocked shots reveal the muscle behind the win. That LeBron James and Dwyane Wade managed to outscore Boston's aging "Big Three" of Kevin Garnett, Paul Pierce and Ray Allen 54-41 also goes a long way toward making plain the relative strength of Miami. While these stats make exemplify the advantages possessed by the Heat in this series, the most telling action of Game 1 might not have been an emphatic blocked shot, a full-court pass from Wade to James or anything accounted for statistically. It may have been a laugh. With Miami firmly in control of the game late in the fourth quarter, James attacked the rim and drew a foul from Garnett before he could get his shot up. Simultaneously renowned and reviled for his tough guy antics, Garnett followed through on his foul by sidling up alongside James and staring him down (or at least staring through/past him from very close proximity). Rather than wilting under Garnett's glare or just turning away and heading to the free throw line, James laughed. 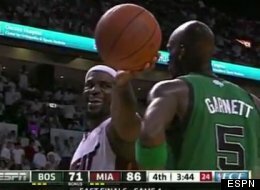 Exposing that mouthpiece tagged with the number 16, representing the number of wins the Heat need to a win a championship, James smiled, laughed and held out the ball in front of Garnett. Topping it off, James can be heard yelling "Yeah.. Yeah." While James' physical gifts and playmaking prowess have been lauded since he was in high school, there have always been questions asked about his resolve and his will to win. This antagonistic moment seems to suggest that James is embracing the role of the favorite and perhaps even the cutthroat villain. Of course, it's also a lot easier to menace an opponent when the result is seemingly assured. Would James have done this last season? Would Garnett have let him? Among those not impressed by James' late-game demeanor was ESPN analyst Skip Bayless, who vented on Twitter. Will LeBron ever grow up, act like a superstar? "Meadowlark" hotdogging up 16 w/ 4 mins. left? Between-legs dribbles, behind back pass? No. Do you agree with Skip? Disagree that this moment has any significance? "They're home, they're comfortable, and when you're comfortable, you do things like that," Garnett told reporters after game when asked about the any potential showboating from Miami. "We have to show them to take them out of their comfort zone. We've got to fight a lot harder."